It’s been five years since the community, Shreveport Common neighbors, downtown workforce and stakeholders met with local professionals to tell them what was important to them in the design of an outdoor community space. 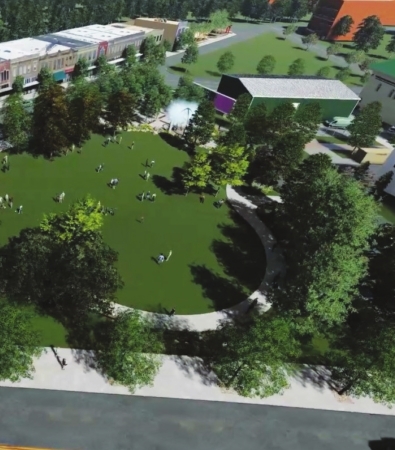 That input formed the design for a programmable urban park, known as The Common, to be located in the 900 block of Texas Avenue at the western edge of downtown Shreveport. 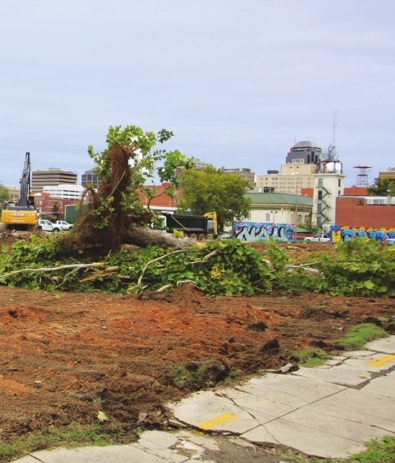 During those five years, neighbors, property owners and public/private partners have been working to revitalize the surrounding Shreveport Common area to the promise of the Vision Plan, while over 30 parades, concerts, pop-up markets, makers’ fairs and UNSCENE events have filled the streets – but the unsightly triangle of concrete and weeds remained at the heart of the neighborhood. Thanks to the city of Shreveport and a $1.2 million economic development grant funding, Mayor Ollie S. Tyler and her staff, Shelly Ragle and Katie Martin “turned dirt.” Also manning a shovel were Pam Atchison (Shreveport Regional Arts Council), Cole Anderson and Wendy Benscoter (Shreveport Common Inc.), Lynn Cawthorne (Caddo Parish Commission District 6), and private sector donors representing the Kinsey family, the Kallenberg family, Jeff and Tammy Lowe, Phillips Energy and the Downtown Development Authority. The Green Oaks High School marching band and over 200 neighbors, members of the original Mayor’s Advisory Committee, community task forces, Choice Neighborhood representatives and supporters cheered them on. The Common is located at the heart of Shreveport Common, bound by Texas Avenue and Cotton Street within sight of the Municipal Auditorium. The green space with art-inspired amenities has been a pinnacle project of the redevelopment of the nine-block area based on the City/Parish 2030 Great Expectations Masterplan and the Shreveport Common Vision Plan, which called for an arts-led revitalization of the area including suggestions for replacing the unused parcels of concrete slabs with an outdoor community space. 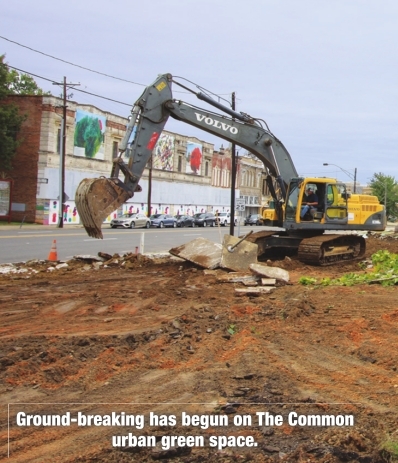 The groundbreaking on Oct. 16 was the official “start” of the construction of The Common, and track hoes were in place as the skies cleared the next day. The park is scheduled to be completed in six months, in time for activities in spring/summer 2019. 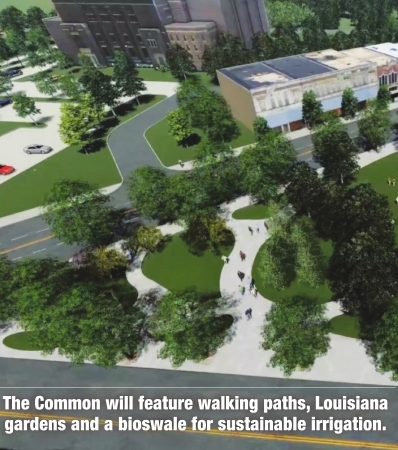 First to be finished will be the green space with walking paths, Louisiana gardens, a bioswale for sustainable irrigation, and a food truck court. 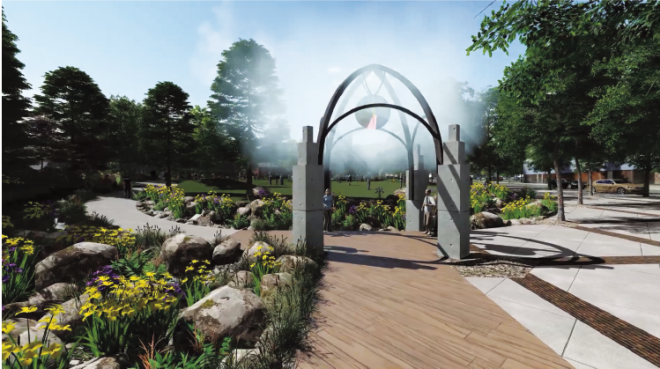 Private donations and legacy naming opportunities are still being sought for additional amenities within the park including a Performance Pavilion, water features and art trees. Shreveport Public Assembly and Recreation (SPAR) is committed to securing and maintaining the park. SPAR will work with local contractors to provide maintenance and will work with local social service organizations to offer workforce training and earned income opportunities for event set-up and light groundskeeping. SPAR, Shreveport Regional Arts Council (SRAC), area artists, and local health and fitness providers are gearing up to program the outdoor space, which will offer an acre of soft grass for picnics, planned and pop-up outdoor concerts, yard games and exercise classes, including workouts designed as fun, such as line dancing and neon yoga. Over 100 trees are planned, both real and sculptural. Outdoor classes are planned by Shreveport Green and Louisiana Ag Center to take place in the Louisiana Gardens, featuring 4,800 square feet of landscaped flowerbeds to attract butterflies. A mister station will be the first art structure in the park, offering a cool spot in hot weather, and a food truck court will give front door access for fresh food options. SMG, management of the Municipal Auditorium, hopes for “tailgate parties” before and after concerts. Area artists are looking forward to popup markets and performance opportunities, and SRAC is committed to programming the park with arts and culture events. Their first UNSCENE event will debut in The Common in December 2019. “FriendsWithYou” creators Samuel Albert Borkson and Arturo Sandoval will work with Academy Award-winning animation director William Joyce, social service agencies and area artists to create and oversee the significant interactive arts installation and exhibition. For more information about The Common, visit www.shreveportcommon.com or email info@shreveportcommon.co.